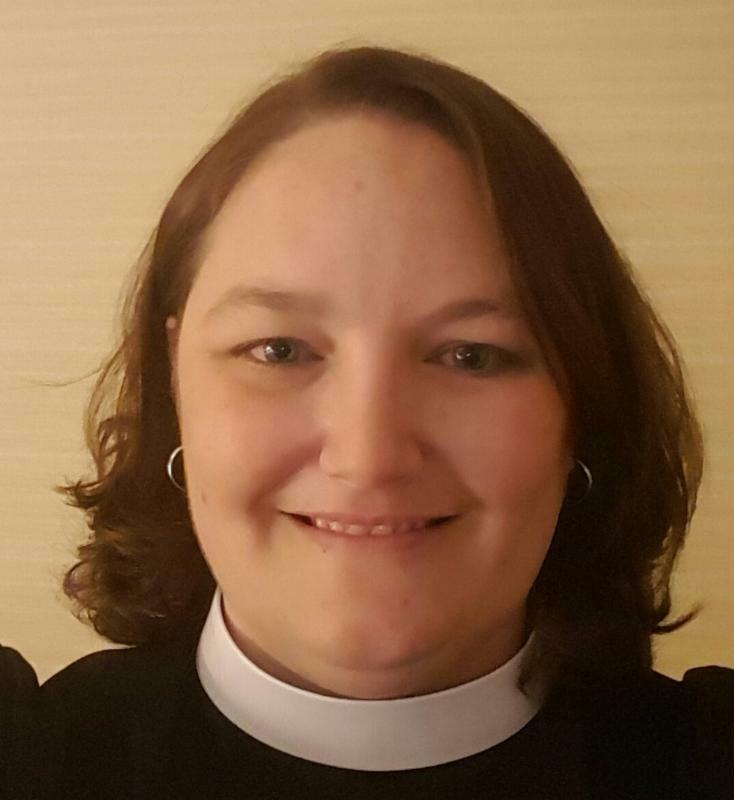 Thank you for allowing me to share with you some brief reflections on stewardship and The Episcopal Network for Stewardship (TENS) at our Special Meeting of Convention on March 4. As a parish priest, I had to overcome a lot of obstacles–both personal and pastoral–to be able to talk about stewardship with any confidence. Part of this lack of confidence on my part was because I was operating out of a place of scarcity. I was worried that because I wasn’t a “tither” (a 10% giver) that I had no right or reason to talk about stewardship; that my financial contribution to the parish was insignificant. But as I worked with my bishop, as I learned from TENS, as I spoke with other clergy in the area, I realized that my contribution was right along the national average for my income and household expenses–I’m a 5% giver. After some serious conversation and prayer, I came to accept that I was not living in scarcity, but I was living in abundance. And as a result, I felt freer to share my time, talent and treasure with my community. Now, let me unpack these concepts of “scarcity” and “abundance” with you. Abundance is about really living as a Christian–about knowing that we are called to be partners with God in making the world a better place. Abundance is about seeing the world around us as a gift from God that it is freely given out of a place of love. Abundance is about accepting the gifts from God that we have been given, and then sharing those gifts with others. We can’t outdo God’s generosity, but we can share God’s love with others. Scarcity, on the other hand, is about believing that you don’t have enough. It’s rooted in fear and a sense of loss. Scarcity is also about control. When we feel like we are loosing control of things, we start grabbing at anything not nailed down, and ultimately we decide we don’t have enough. Scarcity is the opposite of abundance (which may seem obvious), but really it’s the opposite of receiving the gifts freely given to us by God. For me personally, the shift from scarcity to abundance was also about accepting my identity as a beloved child of God and of being created in the image of God. Which means that the abundance of my life is meant to be shared with others; not kept only for myself. As you think about stewardship, whether for yourself or your congregation, I invite you to consider how you live abundantly. Where is the spirit of abundance rooted? Is it in your care of your neighbor? Is it in your sharing of your talents and skills? How are you sharing your abundance? A few years back, my wife Terry and I were in Sarasota, FL to visit my sister and her family. While we were there, we attended church at St. Margaret of Scotland Episcopal Church there in Sarasota. One of the things they gave to newcomers was a generic church business card with all the pertinent information. At the time we thought it was a great idea and we brought one home to show everyone. Although everyone back at Church of the Saviour liked the idea, the idea fell by the wayside. Fast forward to a few weeks ago and Terry and I were preparing for Ash Wednesday and Ashes to Go. Terry remembered the business card idea and thought it would be a good idea to hand them out during Ashes to Go, along with a flyer with Church of the Saviour’s Lent and Holy Week schedule. 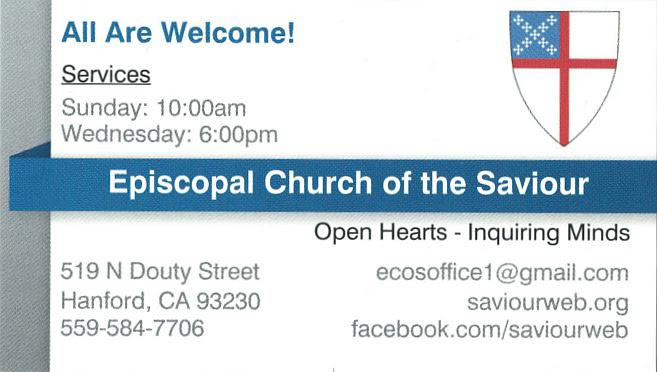 I had put together a business card template, at an online printer, that Church of the Saviour has been using for staff business cards and it was trivial to replace the name and title with “All are Welcome!” and service times. By the way, Ashes to Go was an overwhelming success with over 200 foreheads “ashed”. It was obvious that the business cards could be used year round as an outreach tool and this last Sunday, our Priest-in-Charge; Father John Day introduced them to the congregation. He asked that parishioners take a few and give them out to friends, family, co-workers and anyone else when it seemed appropriate. This last Saturday at the Special Convention, Terry showed one of the cards to Bp. David, he loved the idea and asked that she write up something for the Friday Reflection. I was immediately “assigned” to write the article. This idea is certainly not new or original, but it is such a simple way to introduce your Church to others. It is also very inexpensive; our cards were $18.21 for 500 cards, including tax and shipping. We use Vistaprint online, but any online or local printer would obviously work. If you have any questions, feel free to email me at ecosoffice1@gmail.com. Contact the Diocesan Office for the 2017 password! What’s All the Fuss About CRISPR? El Señor sea con ustedes. 2nd and 4th Wednesdays of the month at 12:15.
this new ministry being offered. Regardless of your proficiency with Spanish, please know that you are always welcome! Dios habla en muchos idiomas. La paz del Señor sea siempre con ustedes.